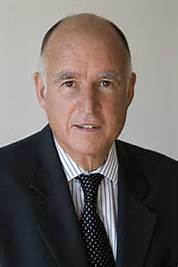 Jerry Brown, Governor of California has the look of a Zen Master. He is an inspiration to anyone noticing hair loss. (If it ain't broke, don't fix it). At 78 years old, he is the oldest and wisest sitting Governor. “Whatever they do in Washington, they can’t change the facts,” Brown said. “And these are the facts: The climate is changing, the temperatures are rising, and so are the oceans. Natural habitats everywhere are under stress." Congratulations to Bernie Sanders, recent Presidential candidate who continues to get a lot of exposure. His receding gray and white hair line reflects his willingness to say what he thinks. Our hats are off to a man with that kind of courage.